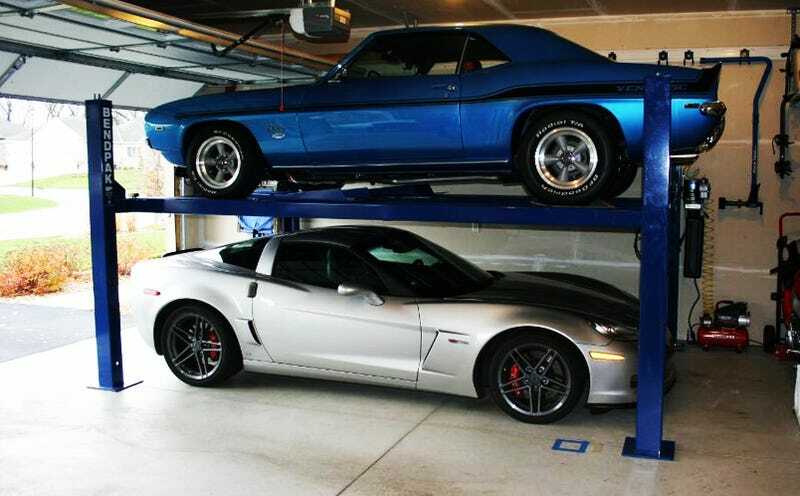 So you've gotten yourself a nice garage so far by finding the right flooring, insulation, lighting and a secure door, but to truly call this a man cave you're gonna need a lift and some tools. The easiest and probably cheapest route for quality tools is to head down to your local Sears and pickup a nice, large set of automotive Craftsman tools in both standard and metric. There are tons of different sets available, ranging from the 1340 piece professional tools set ($6579) to a decent 300 piece professional tools set ($550). You're also going to need some air tools which can also be found at Sears. You'll likely want a 1/2-inch drive impact wrench with a nice torque load for maximum effectiveness. This Craftsman Reversible 1/2 in. drive impact wrench pumps out 500 lb-ft of torque at with a 5.0 SCFM at 90 psi. It should be enough to tackle most automotive projects and if not, you're nuts. As far as lifts go, there are a bunch of different styles out there ranging from two-, four-post and scissor lifts, all with varying load limits. A nice four-post lift (HD-9, $2,660) is offered by BendPak and supports up to 9,000 pounds; enough for most any project vehicle and then some.